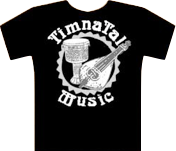 Purchasing this great t-shirt, designed by Amy Medovoy and Diana Jahns, helps support world music production in the Davis/Sacramento area. 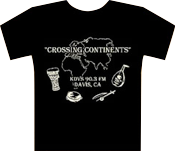 "Crossing Continents" on KDVS radio (90.3 FM) - a community supported radio station, is Gil's weekly radio show. Tune in on the 2nd Sunday of every month from 10am-1pm or listen to past programs from the KDVS archives. This interview was conducted on July 15, 2005 in the village of Houdetsi, Crete at the"Labyrinth" music school. This item is available "at cost".This recording is offered, with the agreement of Ross Daly, as a service to the listeners who missed the "live" broadcast. Contact us for more info. These are recordings from 1995 and 1997 in Israel, of a group of Jewish musicians from Uzbekistan and Tadjikistan who moved to Israel in the early 90’s. The group’s founder and musical director, Suleyman Takhalov, is teaching at the Music Department of Bar Ilan University and the Jerusalem Academy of Music. He has been involved in a number of musical projects in his home country of Uzbekistan, and continues to pursue his musical interests in Israel. This recording documents his first ensemble in Israel, and will be released soon. Takhalov and the other musicians in this ensemble all had extensive musical education and involvement in the traditional music shared by Uzbekistan and Tadjikistan, and were highly regarded as representatives of this tradition.